When we first thought about going to the Galápagos Islands as part of out trip through Ecuador, we ruled it out right away. Why? Because everyone knows the Galapagos are for rich retired people to cruise around on a luxury boat. After just spending 14 amazing (and sometimes stressful) days backpacking around the islands, we are happy to report that anyone can visit the Galapagos, and you can do it without being rich! Before we say anything else, if you love animals, snorkeling, SCUBA diving, boats, and the beach, you will love the Galapagos. If not, really think about why you want to come. These not luxurious islands, and the experience here is not stress-free nor is it cheap. However, you will see some of the most amazing wildlife in their natural environment, and it is really quite amazing. In this series, we will share some background about the islands, our experience with planning our trip, what our day to day experiences were like, and what this trip actually cost us. Hopefully armed with this information, you can figure out if the Galapagos should be penciled in to your South American itinerary. 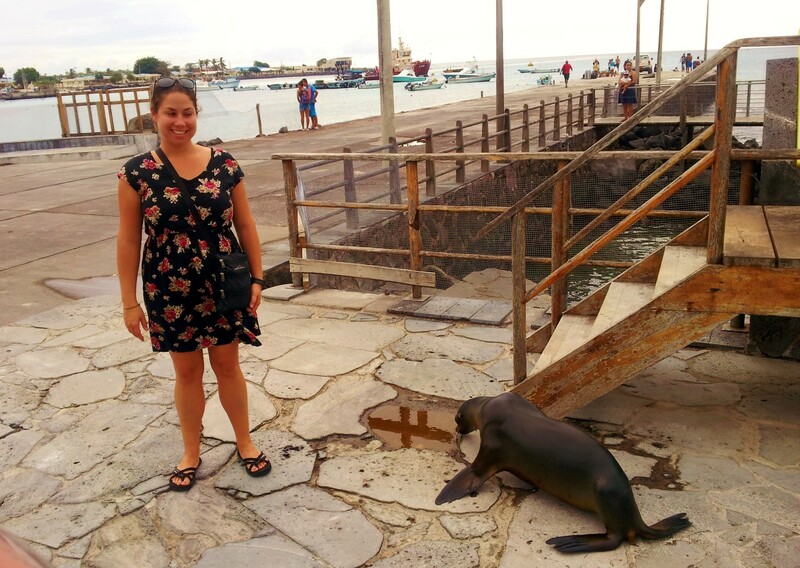 Santa Cruz is the most touristy island, and Puerto Ayora is the main tourist hub of the Galapagos. If you want to book a last minute cruise or a day trip to an island you can’t stay on, you do it here. Santa Cruz also has the most hostels and hotels, although we found them to be the most expensive and worst quality. They have the most restaurants and cheapest food, so if you don’t cook in hostels, you’ll like it here. This is probably the best place to learn to SCUBA dive as well. San Cristobal is the second biggest, and is a good mix between touristy and local. The town was big enough to have plenty to do and many services, without feeling as touristy as Santa Cruz. We had a harder time finding a good dive shop, and an impossible time booking a cruise here. They also have the best malecon, or waterfront, here, if you like hobnobbing with sea lions. Isabella is the smallest island, and is a nice break from the other too. It’s easy to walk around and has a huge beach right in front of the city. Restaurant and accommodation options were more limited but still good quality. Getting between islands, there are usually two “ferries” a day, one early morning and one mid afternoon each way. They cost a flat $30 per leg, and only go between San Cristobal-Santa Cruz, and Santa Cruz-Isabella. You can not take a direct boat from San Cristobal to Isabella; instead, you pay for two $30 ferries. There is also a flight between the two. The boats are all small, 20-person speedboats, and they are choppy! Several companies run each route and one is no different for the rest. They are all equally chaotic and disorganized at the port. There’s no way around the fact that everyone has to pay roughly the same amount to get to the Galapagos. Flying is the only way to get to the islands. You can only book a flight from Quito (UIO) and Guayaquil (GYE) to either Santa Cruz/Baltra (GPS) or San Cristobal (SCY). Flights are a bit cheaper from Guayaquil, and flying in to San Cristobal. You can save money by price shopping the airlines (LAN, TAME, and Aerogal all fly in), but most of their websites are slow and hard to use (only LAN is on popular sites like Kayak), so price shopping is tedious. In general, expect to pay between $400-500 per person for a round-trip flight. Also, everyone is required to pay an additional $110 in park fees in order to enter the islands. So your base cost is always at least $500 per person before stepping foot on the island, so budget accordingly. Cruises. There is a lot of information available online about taking cruises, and you can book them from your living room a year in advance all the way to the day before when you are in Santa Cruz. Costs are going to vary depending on how luxurious the cruise is and where you book it (at home will be the most expensive, followed by in Quito or Guayaquil, and last minute will be the cheapest). We didn’t take a cruise, but would have considered going last minute. However, it was really difficult to book last minute cruises on either San Cristobal or Isabella, so make sure to fly into Santa Cruz if you want to book last minute. Live-Aboard Dive Boat. This is the only way to SCUBA dive some of the more remote islands (like Darwin Island). You would want to pair this with a land tour to not miss the other sites. The islands of Santa Cruz, San Cristobal, and Isabella all have major tourist facilities. They are all connected to public ferries that run regularly and are easy to get tickets for. There are restaurants, SCUBA diving shops, and tour companies on each island. You will even have wifi! That being said, DIY info was sometimes sparse. Many hostels and hotels aren’t on Booking.com or HostelWorld, so you have to spend a bit more time booking accommodations. TripAdvisor ended up being a great asset, as all of the major sites are well reviewed and can be a great starting point for putting together an itinerary. These sites were also very helpful. The next three parts of this series will go in to our experience on each island, as well as the activities we did on each and whether we’d recommend them. In the final post, we will tally up our costs, which hopefully you can use as a guide for budgeting your trip to the Galapagos!